All Amaryllidaceae are perennials and apart from Clivia, Cryptostephanus and Scadoxus, which have rhizomes, the majority have bulbous storage organs. While growing, the bulb is kept sufficiently deep below ground by special roots that lengthen and contract. Most often the leaves are strap-shaped and smooth but occasionally they have unusual shapes, markings and coverings. 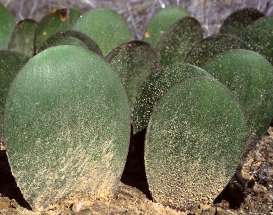 Genera like Eucrosia and Scadoxus, which occupy habitats with low light-intensity, have leaves that are especially broad and flattened, whereas in the semi-arid parts of southern Africa, species of Brunsvigia, Crossyne, Gethyllis and Haemanthus have leaves covered with variously shaped hairs. The leaves in Crossyne and some Haemanthus species are also attractively spotted with dark green or red. Amaryllidaceae usually have numerous flowers held in an umbrella-like cluster at the end of a leafless stem, called a scape. 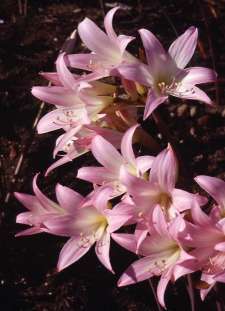 In unusual genera like Gethyllis (kukumakranka), however, the scape carries only one flower and remains subterranean. Flowers are frequently large and showy and vary from star-like to trumpet-shaped or tubular. Colours range from red, orange, yellow and pink to white, whereas bluish flowers are only found in Griffenia, Worsleya and Lycoris. They all produce nectar and are often heavily scented. Each flower has six segments (tepals), frequently arising from a long to short tube. The flowers of Narcissus (the daffodil) characteristically have a large, cup-shaped corona, which is an outgrowth of the tepals. Six stamens are typical of the family, but some Griffenia species have five stamens and some Gethyllis species have multiple stamens with about 60 anthers. In Pancratium and Hymenocallis the stamens are fused to form a large cup, which resembles the corona in Narcissus. The ovary is inferior (i.e. located below the tepals) and carries a single style. The fruits are dry or fleshy and contain dry, dark and often flattened, or fleshy, round, and greenish seeds. The basic chromosome number of x = 11 is most common. Southern Africa has 210 endemic Amaryllidaceae species. Namaqualand and the Cape Region together have 111 species and 77% of these are found nowhere else. Amaryllidaceae occupy many different habitats: seasonally dry places, ephemeral pools, the understorey of rainforests, and rivers. First described by Jean Henri Jaume St. Hilaire in 1805, the family is named after Amaryllis, a pretty shepherdess mentioned by Theocritus, Virgil and Ovid. Close relatives are Alliaceae (the onion family) and Agapanthaceae (the agapanthus family). Despite recent proposals to combine the three families, their chemical compounds are nevertheless sufficiently different to keep them apart. 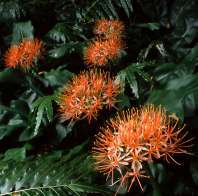 In South Africa, many Amaryllidaceae species are adapted to cope with wildfires and those that depend on fire to flower are appropriately known as fire lilies. Especially in Cyrtanthus the flowers are so diverse that they attract sunbirds, bees, long-tongued flies, butterflies and moths. Southern Africa also has several Amaryllidaceae with remarkable dispersal abilities. 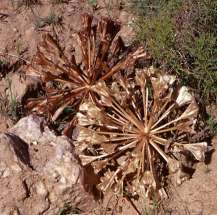 Species of Brunsvigia, Boophone and Crossyne in particular have large, light, spherical fruiting heads that tumble along the ground in the wind, shedding their seeds as they move. Habitat loss is currently the greatest threat to the Amaryllidaceae in South Africa, where 59 species are endangered or vulnerable and 58 species are near threatened. World-wide the Amaryllidaceae have greatest economic value as ornamentals. In addition, huge numbers of plants are traded for traditional medicines. Africans use the bulbs and leaves as poultices and decoctions for treating sores and digestive disorders, but in large dosages they are extremely poisonous. The Zulu people of South Africa also use rhizomes of clivias as protective charms. In Peru, the Inca people frequently depicted flowers of Amaryllidaceae (Ismene, Pyolirion and Stenomesson) on ceremonial drinking vessels. In southern Africa, however, indigenous art portraying plants is rare. The single known rock painting of a Brunsvigia species in Lesotho probably emphasizes how much the San people valued the bulbs for their psychoactive effects. In the Garden In cool temperate climates, Narcissus (daffodils), Leucojum (snowflakes) and Galanthus (snowdrops) are among the most important spring-flowering bulbs in commerce. Elsewhere, in warm temperate and subtropical climates, species of Amaryllis, Clivia, Hippeastrum, Nerine, and Zephyranthes are the most popular choices for gardens and containers. Du Plessis, N. & Duncan, G.D. 1989. 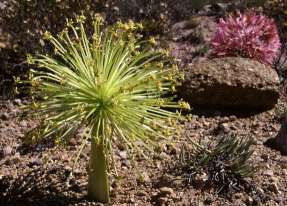 Bulbous plants of southern Africa. A guide to their cultivation and propagation. Tafelberg, Cape Town. Loubser, J. & Zietsman, P.C. 1994. Rock painting of postulated Brunsvigia sp. 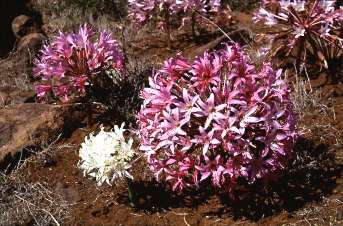 (Amaryllidaceae) at Thaba Bosiu, western Lesotho. 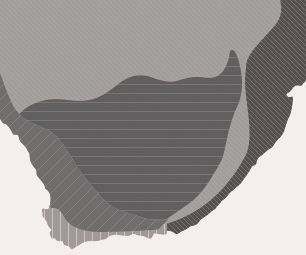 South African Journal of Science 90: 611, 612. Manning, J, Goldblatt, P. & Snijman, D. 2002. The color encyclopedia of Cape bulbs. Timber Press, Portland, Oregon. Meerow, A. & Snijman, D.A. 1998. Amaryllidaceae. In K. Kubitzki, The families and genera of vascular plants 3: 83-110. Springer, Berlin. Meerow, A.W., Fay, M.F., Chase, M.W., Guy, C.L., Li, Q-B.,? Snijman, D. & Yang, S-Y. 2000. Phylogeny of Amaryllidaceae: Molecules and morphology. In K. Wilson & D. Morrison, Monocots: systematics and evolution: 368-382. CSIRO, Melbourne. Paterson-Jones, C. & Snijman, D. 1996. Dramatically different-winter rainfall amaryllids. Africa-Environment & Wildlife 4,2: 25-30. Snijman, D.A. 2000. Amaryllidaceae. In O.A. Leistner, Seed plants of southern Africa: families and genera. Strelitzia 10: 570-576. National Botanical Institute, Pretoria. Vargas, F.C. 1981. Plant motifs on Inca ceremonial vases from Peru. Botanical Journal of the Linnean Society 82: 313-325.